Wine 101 is the start of your wine education. It is about how it all began. It is fitting to start with a bit of ancient history. We don't really know when winemaking started, but it is probably safe to say that it started by accident. There was no enology involved, most probably someone had some grape juice, and it began to ferment. All of a sudden, there is something wonderful. 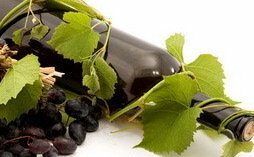 Though vines are some of the oldest plants in the world, millions of years old; wine production itself is "only" a few thousand years old. We know that it was being produced in the Middle East because the Bible tells us that Noah and his family had access to wine. Greek Mythology is deeply steeped in the wine culture. Dionysus, the beautiful god of wine and fertility, is said to have discovered the the vine, and the wonderful juice that could be extracted from it. He is also associated with frenzy and ecstasy, which are certainly byproducts of too much wine consumption! Wine has been important in trade, from the beginning of history to the present. Archeologists have found Greek and Roman ships at the bottom of the Mediterranean with wine amphora destined for faraway lands. Wine trade continued through the Middle Ages, as it does today. Just walk into any wine shop, or even supermarket, and you will find bottles representing wine regions from every corner of the world. Wine 101 is also about understanding how wine is made. Winemaking across history and around the world pretty much consists of the same elements; fermentation of the grape juice, and maturation. It sounds simple enough, but wine is a combination of science and art, and it is the art that makes all the difference. The instinctive knowledge and creativity of the winemaker is what differentiates a so-so wine from a great one. He or she decides which grapes to use, and at what degree of ripeness. Whether to use wooden barrels, or steel tanks. How long to ferment and age. Whether to add sugar or other ingredients. Though winemaking started out as a delicious accident, it is the degree of sophistication of winemakers throughout the ages that has elevated it to the mythical status that it has held in every culture, from its earlies beginnings, and to the present. So We Say Thank You to Those Creative Souls!